If you’re a teacher, you know that getting make-up work for students can be one of the most constant of stresses. Try this for a smooth sailing school year! It’s that time of year that kiddos and teachers are getting ready for the next adventure in their lives that’s also known as a school year! Sparkling with shiny new goals, a clean slate, and a few butterflies, the new school year is a chance to rise to new heights, make new friends, and learn more than ever. But as the school year goes on, there inevitably comes the day when kiddos catch a cold and can’t make it to school. How to get them back on track? As a teacher, this can be one of the most frazzling of dilemmas, and you might know it all too well. But guess what. It doesn’t have to be frazzling! 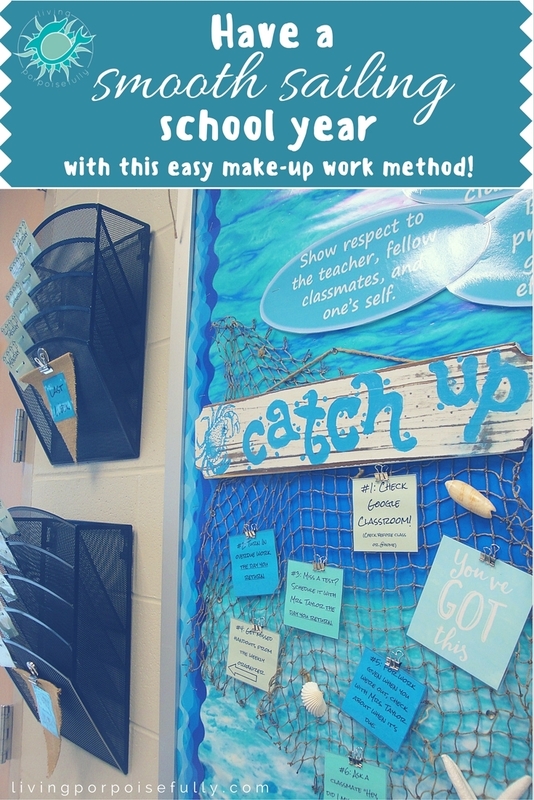 We’re sharing an easy make-up work method that makes for smooth sailing all school year long. Best of all, it doesn’t take up a lot of room or effort once it’s in place. Having a designated go-to spot in the classroom that’s organized into each day of the week, preferably for 2 weeks. Two organizers that have at least five sections each. They can be wall organizers or tabletop. Or just folders attached to the wall. Instructions for the students if you’re having them use it directly. I used mesh wall organizers, and originally tried using magnets to label each day. But the magnets were easily knocked off (and slipped down into the bottom!) by kids putting folders back in to the slot. That way I can switch the sign from week to week and simply remove the folders in the oldest week (and now it becomes “this week” to fill with this week’s handouts). Now, if you’re having students be independent to get their make-up work, it’ll be important to instruct them on how to use the station. Turn in overdue work the day you return. Miss a test? Schedule it with Mrs. Taylor the day you return. Get missed handouts from weekly organizers. For work given when you were out, check with Mrs. Taylor when it’s due. I explain to the students at the beginning of the year what to do when they’re absent, and if they come to me first instead of the make-up work station, all I have to do is point! This makes them incredibly self-sufficient and responsible. It’s amazing how having a system set up for make-up work can truly make such a difference in each and every day. Best wishes for a smooth sailing school year! Can I PLEASE be in your class? 🙂 I love your creativity while taking care of the everyday tasks involved in teaching. Awesome! LOL! 🙂 Thank you so much– what a difference it makes in the day-to-day!